The temporary closure of the park has been announced and we know it’s a sad and emotional time as you start to dismantle your sites and face a year without visiting the park. As the park managers, we are committed to sharing with you as much information as we can at the right time to ensure you feel informed about what’s going on and that the information is accurate and timely. We have set up a community Facebook page to be the central place we will share the progress of the park redevelopment. Follow us on facebook.com/lakeshoreredevelopment as the place with the most up to date information. You are welcome to share your stories and photos of your time in park as we collect a range of memorabilia which we can then incorporate into the park in the future. We invite you to a community forum on Monday 11th of March at 830am. Join us for a BBQ breakfast in the park and we will share with you information about what’s happening between now and June and answer the questions you have, if we can. There have been a few other questions that have come to the team at the park, so thought we’d answer. 2018: Park Closure date: from 1st July the park will no longer be open for guests and annuals to stay over night. Access is for the removal of property only within the times outlined below. 30th September 2018: Office closure, site closure. From the 1st October, the park will begin demolition and it will be assumed that any property left has been abandoned. Designated dump points have been set up around the park, with separation of rubbish into piles of timber, hard rubbish and mattresses. We suggest you make sure your public liability insurance is current prior to the demolition or removal of your property, and it would be great if you could let the office know when you are removing your main structures to ensure a staff member is on hand to sight your property leaving the park. Wanting to sign your structure over to the park? If you have decided not to remove your van, but instead sign it over to the park to remove, please see the team at the office for a notification form. Adventures Victoria will demolish all vans left on site. There will be no sale of the vans left behind. When will the new site map and proposed plans be available? The proposed plans for the site are being prepared by AV’s town planners, but have not been shared as they are not final. Once we have plans that are ready to submit to council, we will undertake a public and community consultation process to allow everyone to give feedback. We are aware the removal of property is an emotional process for some of our community. We have had reports of rowdy behaviour and looting of property. To support everyone in the park, we have increased our security in the park on Fridays and Saturdays between now and the park closure in June. The team in the office are taking registrations of interest for those wanting to continue their relationship with the park once it reopens in 2020. No sites are being allocated as the plans aren’t final, but you are welcome to register your interest in either a powered site or a new cabin and we will alert you when the plans are approved. 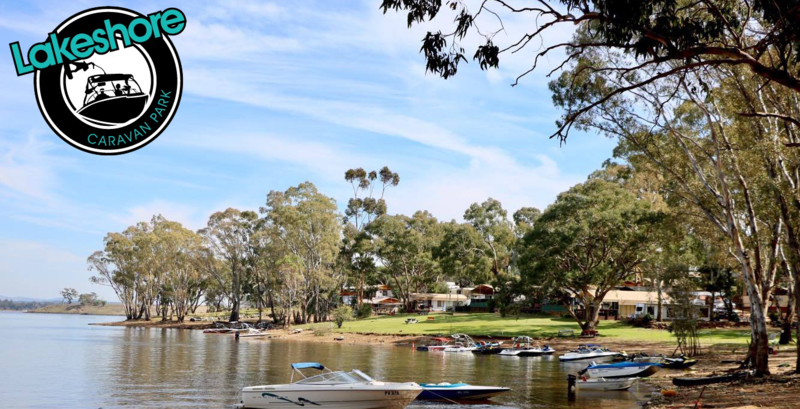 Lakeshore Caravan Park offers a combination of annual Caravan sites, camping grounds, powered Campervan sites, and ensuite cabins as well as Day Passes to access the Lake via our private Boat Ramp.